How did you first learn about architecture and when did you decide that it was an area of interest for you? My interest in architecture began as a child. I enjoyed solving puzzles and crafting things; even making dollhouses for my younger sisters when I was in middle school. Moving into high school, I excelled in drafting and architecture courses producing award winning work in school competitions. I spent my 32-years practicing architecture with McDonald’s, a Fortune 500 company. During my tenure, my team designed and managed construction development for about 1,000 locations. Now in my retirement, I dedicate my time to volunteer community and planning work. I previously served as Past Trustee -Village of Maywood & Village of Bellwood, and am the Current President of Neighbors of Maywood Community Organization and President of Neighborhood Advancement Center of Maywood. What made your work enjoyable and exciting or inspires you professionally? The aspect of my job that I enjoyed most was having an impact on work that people in all 50 states are aware of and visit. The experience of analyzing and designing for a myriad of conditions and arriving at working solutions makes each job unique and exciting. My professional inspiration is regularly renewed as I go from place to place networking and experiencing history from era to era. The professionals I have engaged with as an architect can match wits and character with people anywhere and from any profession! What is your proudest professional accomplishment or achievement? There are many! Being the longest service architect in the history of McDonalds, an iconic international retail institution; the first and only black president of AIA Illinois in 2010; Having projects in all fifty states, and serving as the 1995 NOMA National President and 1994 NOMA Conference Chair in Chicago. It’s in my blood. I was one of the first students to join I-NOMA and have been a member for almost 40 years! As time goes on, the organization is building strength and relationships. The connectivity is critical. 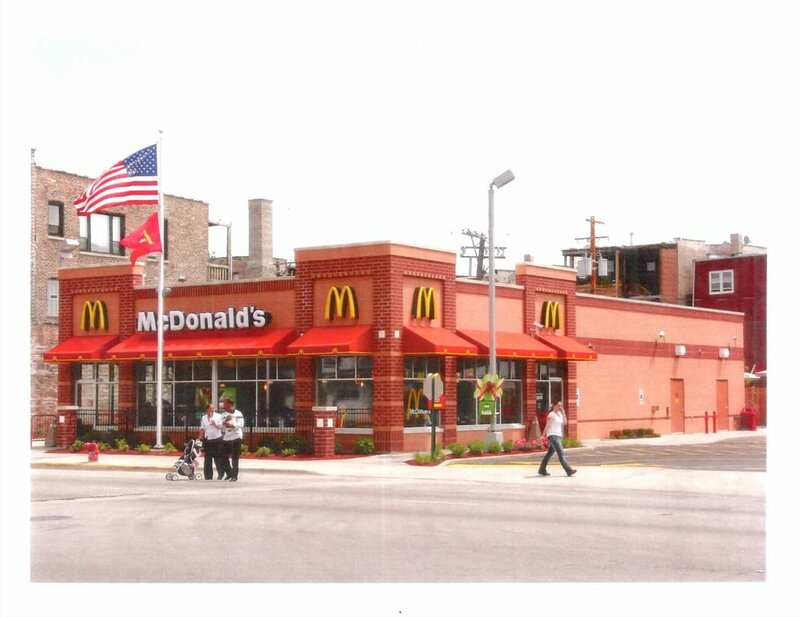 The project was part of a newer trade dress establishment for McDonalds in the City of Chicago, which was seeking a design that could become associated with the city for present and future locations. The new design needed to establish a more modern identity that achieved a measure of urban appeal and efficiency, while maintaining materiality and scale that referred to the architecture of the surrounding neighborhood. The solution has proven successful as a model that is inviting to families and pedestrians.